The Audi Q5 was originally Audi’s first SUV. Since then, it has become its best selling model. With rivals that include the Range Rover Velar, BMW X3, Jaguar F-Pace, Volvo XC60 (an all-new version is coming soon) and Land Rover Discovery Sport, that’s a bold claim. In order to deliver, Audi has equipped the Q5 with its latest technology and offers it with a range of petrol and diesel engines, including V6 units. 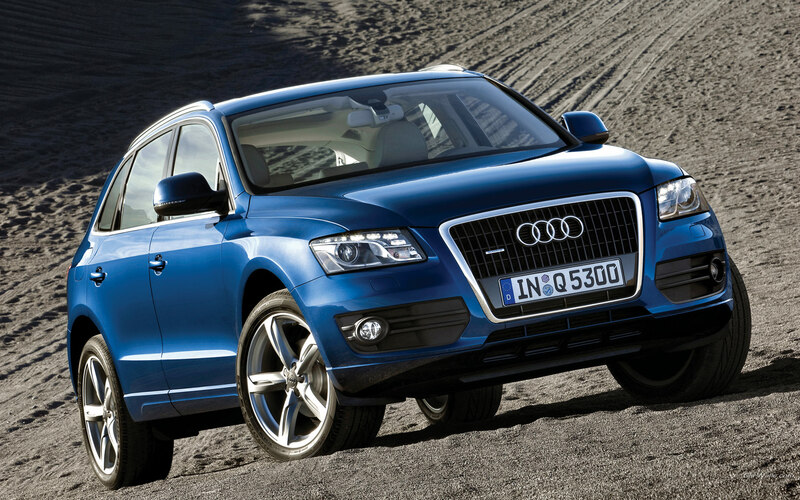 Adding to the premium feel, all Q5s use an automatic gearbox and four-wheel drive. The latest version is a slight upgrade in size to the original. The boot has a small load lip to negotiate but is competitive with rivals for overall space, matching the BMW X3 and Mercedes GLC and beating the Volvo XC60. Only the Land Rover Discovery Sport is significantly more spacious (so much so that it offers seven seats to the five in the Q5). Boot space can be extended by folding the rear seats, although they don’t go completely flat. As an optional extra you can also order the Q5 with rear seats that slide fore and aft to trade rear leg room for boot space. Slide them all the way back and the Q5 offers enough room for a tall passenger to sit behind a tall driver without their legs brushing the seat in front. Head room is also excellent and it’s possible to fit three adults side-by-side, although whoever is in the middle will need to straddle a large lump in the floor. The fact that the rear doors don’t open to the full 90 degrees also hampers access slightly. In the front the Q5 feels impressively spacious and has plenty of large storage spaces for phones, wallets, keys and water bottles. The Q5 excels in providing comfort of high Audi standards. It gets off to a great start, with quiet engines ( the 2.0-litre petrol and diesel options are both very smooth) and barely any wind noise at motorway speeds. You do hear a bit of tyre noise, but it’s far from excessive, and the seats are comfortable, with lots of adjustment to help find a good driving position. Where you need to be careful is in speccing the Q5’s wheels and suspension. On S-line suspension with 19-inch wheels, for example, it is far too firm, jostling occupants around whether you’re trundling through a town or tackling a country road. Things improve dramatically if you add the optional air suspension, which gives the Q5 a much calmer ride (there’s also a cheaper Adaptive comfort suspension upgrade, but we are yet to try this). Regardless of what suspension set up you opt for, I’d recommend sticking to 18-inch wheels for the best ride. Thus equipped, the Q5 is a fantastically comfortable SUV. This is another area where the Q5 excels itself. It is beautifully finished, hi-tech and easy to operate. Take Audi’s MMI infotainment as a prime example, packing as it does satnav (on Sport and S-line models), music streaming, DAB radio, smartphone mirroring and much more into a system that is crisply presented and easy to navigate. Upgrade to Audi’s Virtual Cockpit and you can even opt to display much of this information on a 12.3-inch digital screen where the dials would usually be. Only slightly fiddly heater controls and the placement of the Drive Select button (for the Q5’s various driving modes) on the far side of the centre console where it isn’t terribly easy to reach detract from the overall excellence of what is surely one of the best SUV interiors around. Though it is a SUV, it doesn’t make itself a burden of drivers. The Q5’s raised driving position gives a good view out, although the chunky rear bodywork makes it difficult to judge where the rear of the car ends. Thankfully all models come with front and rear parking sensors, and a reversing camera is among the long list of optional extras. Audi only offers the Q5 with an automatic gearbox. The seven-speed unit fitted to 2.0-litre models is ultra-smooth apart from the odd hesitation when pulling away (experience of the eight-speed gearbox fitted to V6 models in other Audis suggests it won’t suffer from the same issue). Light steering at low speeds also helps with manoeuvring. The fact all Q5s are fitted with Audi’s quattro all-wheel-drive system means it is capable in all weathers, and with air suspension fitted you can even raise the ride height if you fancy taking it off-road. Handling is improved compared with the previous Q5, and there’s plenty of grip, but the steering weight feels artificial and you need smaller wheels or air suspension to get any sense of the car flowing along a good road. As such, a Jaguar F-Pace will be better suited to keen drivers. Audi’s warranty lasts for three years or 60,000 miles – whichever comes sooner – whereas BMW and Mercedes offer unlimited mileage cover over the same time period. Audi claims that the Q5 2.0 TDI offers the best fuel economy in its class, at 56.5mpg in official EU tests. However, that’s only compared with rivals featuring an automatic gearbox and all-wheel drive. If you’re happy to settle for a manual gearbox or front wheel drive then a Land Rover Discovery Sport edges it, and a Mercedes GLC returned identical figures. With the full complement of airbags as standard plus a strong core structure the Q5 should stand up well in the event of a crash. Audi also fits technology to prevent that crash happening in the first place, such as its Pre-Sense City autonomous emergency braking system, which can slow or stop the car by applying the brakes if it senses an impact is imminent. On the options list meanwhile you can choose from the firm’s full range of safety devices, including an active lane assist that will automatically nudge the car back into its lane if you drift over a white line, and a traffic jam assist function that can drive the car at low speeds for short distances. Previous articleAudi Q3 – Does it drive as sleek as it looks?